The Lifeline program has provided a discount on phone service for qualifying low-income households since 1985. In 2005, the program was modernized to include cell phone services and discounts could be applied to pre-paid wireless service plans. 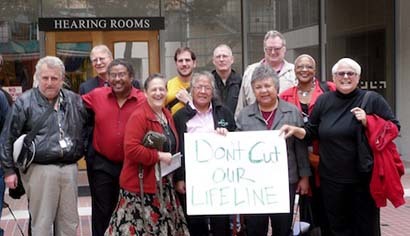 In 2014 the CPUC approved changes to Lifeline Telephone Services which will keep low-income customers connected to affordable, reliable phone service whether they chose a mobile or landline plan for discounted service. In the landmark decision, the California Public Utilities Commission (CPUC) agreed with TURN that Californians without social security numbers should not be disqualified from the state program. California is the first state in the U.S. to eliminate the requirement.The changes demanded by TURN and other consumer groups were key to insuring California’s commitment to universal phone service while expanding the choices available to customers. In her decision, CPUC Commissioner Catherine Sandoval credited testimony from public hearings organized through TURN’s organizing project. More changes are coming to the California Lifeline Program. We will keep you posted! The bill creates a “Lifeline Oversight Board” which is intended to enhance the effectiveness of the Universal Lifeline Telephone Service (ULTS) Trust Administrative Committee. This bill represents a long overdue update of the body tasked with advising the Commission on the effective development, implementation and administration of the California Lifeline program today and into the future. Since 1985, the Lifeline program has provided a discount on phone service for qualifying low-income consumers, to ensure that all Americans have the opportunities and security that phone service brings, including being able to connect to jobs, family and emergency services. However, residential consumer participation rates in the LifeLine program continues to be much lower than the eligible population rate. In 2017, the CPUC estimated that there would be 3.2 million participants in the program. However, enrollment is now estimated to about 1.6 million – about 50 percent less than was was estimated last year. Strengthen the role of the Advisory board by restructuring and clarifying the duties and responsibilities of the board. Recruit community members to fill vacant seats which have been vacant since 2014. The current ULTS Trust Administrative Committee Charter requires that the members of the committee include two consumer organizations and three community based organizations, each of which represents a different constituency based upon geographic, language, or economic criteria. Since 2014 three CBO seats and one Consumer Organization seat has remained unfilled. Require coordination with other California public purpose programs, including the current Low Income Oversight Board, to support implementation of the program and expand opportunities for outreach and education about the program. The bill has gone through the Assembly Communications and Conveyance with 8 votes in Support, 4 against. It is now in the Assembly Appropriations Committee. Getting more letters of support once it goes to the Senate. Identifying individuals for nomination to the Committee. Please contact Ana Montes for more information at amontes@turn.org.